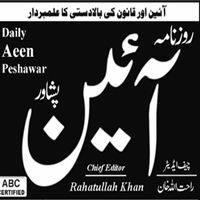 Daily Aeen Peshawar is publishing from the capital of the Pakistani province of Khyber Pakhtunkhwa. Peshawar is the largest city of Khyber Pakhtunkhwa province, and according to the last census is the ninth-largest city of Pakistan. Daily Aeen Peshawar is an ABC certified Urdu newspaper and also a member of CPNE. It is containing news about current events, other informative articles about politics, sports, arts, and so on and advertising. The Chief Editor of Daily Aeen Peshawar is Rahat Ullah Khan. It has 8 pages and You can purchase it by spending 10 PKR. For Those Who Want to Read Daily Aeen Peshawar They Can Visit It's Official Website: www.dailyaeen.com.pk. At The Website You Will Find Old Daily Aeen Peshawar Too. You Are Visiting Daily Aeen Peshawar Page of Epaper.PkNewspapers.com.